About a month ago I wrote about trying to get locally-based NPR host, Anne Strainchamps (that's her on the right in the picture above) to ask UW-Madison professor Richard Davidson about his continuing involvement in the use of young monkeys to study the neurobiology of anxiety and fear during her live public interview with him. He was promoting his new book promoting meditation. He and the university cultivate his public persona as a personal friend of the Dalai Lama's and a man of compassion. Unless pointedly asked, he never mentions the young monkeys frightened, hurt, and killed in that part of his work. Ms. Strainchamps didn't ask him about it; she left her audience in the dark. I used to think that thoughtful people who don't care about animals just hadn't taken the time to learn and think about the likelihood that they have inner lives and experience a range of emotions that are probably similar to ours. 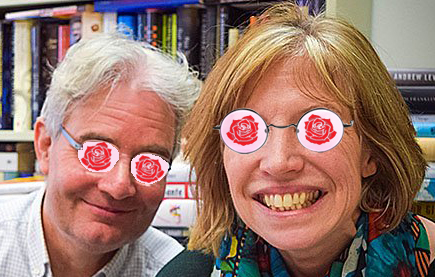 But that was before I took off my rose-colored glasses. The unfiltered world is bleak. It is filled with people like Richard Davidson who not only believe that animals share emotions like fear and anxiety with us, but exploit those similarities and get rich from doing so. I think people who hunt likewise imagine the animals' fear and pain. Certainly this is true for other horrific activities like dog and bull fighting. On the Saturdays I work, I sometimes catch Ms. Strainchamp's show on the radio. Its called "To the Best of Our Knowledge - Exploring the Deeper End of Ideas." This past Saturday, the show was titled “Loving Bees.” (A cause du jure rather than a concern for small animals?) In any case, the program featured a brief interview with a neuroscientist who had some interesting ideas about the mind of insects, something I've also written a little bit about. Interviewer and the program's Executive Producer, Steve Paulson, also in the photo in the image above: “So brain size is not the be-all and end-all here of consciousness. I don't know, but I'll wager that no one associated with the show will alter their behavior toward animals as a result of this expert opinion that it feels like something to be a bee. No one had much doubt that it felt like something to be an Indian or a slave, and yet the most highly educated people in colonial America bought and sold slaves and killed Indians and took their land. There is something odious about educational and news programing that does not seem to affect even the people producing it. It has to have something to do with the altitude of their lofty towers; the rarefied atmosphere somehow interferes with putting two and two together. To the best of my knowledge, in most cases no amount of data is sufficient to sway the opinion, let alone behavior, of someone with a vested interest in the status quo. Vivisectors are a breed unto themselves. For some reason, some of them feel like they have to justify the terrible things they and their ilk do to animals; not all vivisectors of course, most of them don't say a word in public about the things they do to animals in their labs, and when asked are circumspect about it. Those who are driven to defend their industry frequently lament the fact that most of their colleagues would rather not draw their neighbors' and non-vivisecting friends' attention to the nitty-gritty of their gritty work. If it weren't for the few outspoken apologists, we wouldn't have as much insight into their beliefs and worries as we do, albeit limited as it is. The impression is that, doggone it, vivisectors are animal lovers too. The impression, not necessarily the truth. In fact, some vivisectors don't think the animals they hurt can suffer. As wild as that sounds, it is worth noting that there are white doctors and nurses who still don't think people with skin darker than theirs feel pain the way they do. [Hoffman, Kelly M., et al. "Racial bias in pain assessment and treatment recommendations, and false beliefs about biological differences between blacks and whites." Proceedings of the National Academy of Sciences 113.16 (2016): 4296-4301.] This is nothing new. ...I think that suffering requires the presence of a self because otherwise the existence of the subjective experience of suffering doesn’t make sense. This is a variant of the problem of consciousness: do non-human animals have a self? That’s doubtful. Maybe apes and dolphins do, rats and mice probably don’t. But, again, that is highly speculative. Hence, there has to be a scale of suffering. In that scale, humans are capable of much deeper suffering (and much deeper happiness) because we can see ourselves as selves with an existence extending in time, so we not only suffer in the present, but we can see that we have suffered in the past and that we will suffer in the future. Without episodic memory and extended consciousness, animals do not have selves with that continuity in time. He doesn't believe the rats he hurts can suffer because he thinks they don't have a sense of self. So, seemingly, whatever nominal welfare standard he is required to give lip-service to, it is to him not really necessary since rats are little more than animated machines, an opinion that has been relied on to absolve vivisectors since it was first voiced by Rene Descartes 1640. Biography Dr. Marvizón’s research field is pain neurophysiology. He investigates chronic pain disorders at the physiological, cellular and molecular levels using the Latent Sensitization animal model. Latent Sensitization is triggered by injuries that cause long-term inflammation or nerve damage, such as skin incision, injection of inflammatory agents or nerve transection. This is followed by a period of increased sensitivity to mechanical (for example, poking with nylon filaments known as von Frey filaments) or thermal (focusing a hot light on the paw) stimuli. The key part of the Latent Sensitization model is that when that period of hypersensitivity has ended it can be reinstated temporarily by an injection of an antagonist of opioid receptors (mu, delta or kappa) or of alpha-2 adrenergic receptors. This reveals that the neural pathways that process pain remain sensitized but at the same time are suppressed by the activation of these opioid or adrenergic receptors. It is likely that similar process occur in chronic pain patients. Another important characteristic of Latent Sensitization is that pain can also be reinstated by stress (like making a rat swim in a bucket of water or exposing it to a new environment). Again, this happen to chronic pain patients. All Marvizón’s nastiness aside, what initially caught my attention was his claim that "there has to be a scale of suffering." I think he's wrong in the context he is talking about. Obviously, suffering isn't the same for everyone in every circumstance. I suffer a heck of a lot more when I stub my toe really hard. Marvizón’s claim is that humans suffer more than other animals, and there is some sort of step-wise increase in their potential for suffering in species more like us. This suggests to me that we should be able to compare these imagined levels of potential for suffering and come up with some sort of calculus that would give us the ability to weigh the potential benefits against the certain harms. 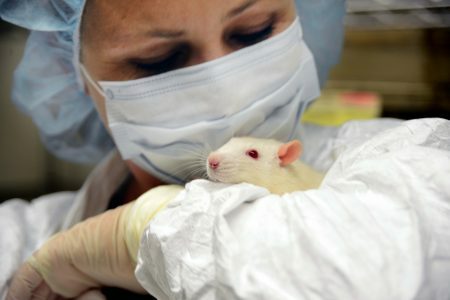 A straightforward case might be something like this: If we test some drug on 1,000 rats (and kill them) and it leads to saving 1,000,000 humans, would that be ethical? If we had some unit of measure, say a potential for suffering (pfs) score that we could assign to humans and rats, we could plug in the numbers and get an objective answer. Of course, such a scheme could be used to justify human vivisection as well, so maybe that plan would be too dangerous. Nevertheless, if there is a scale of suffering, it could at least shed some light on the amount of suffering animals of different species might be subjected to from us using them. I suspect though, that people like Marvizón don't actually believe there is a meaningful scale of suffering. I think most people who use animals, even most people who simply eat them, actually believe that animals have no ethical weight at all. So combined, between war and genocide, we have killed somewhere in the neighborhood of one billion, 43 million people, or 1,043,000,000 of us. The population of the U.S. is about 325,000,000 right now. 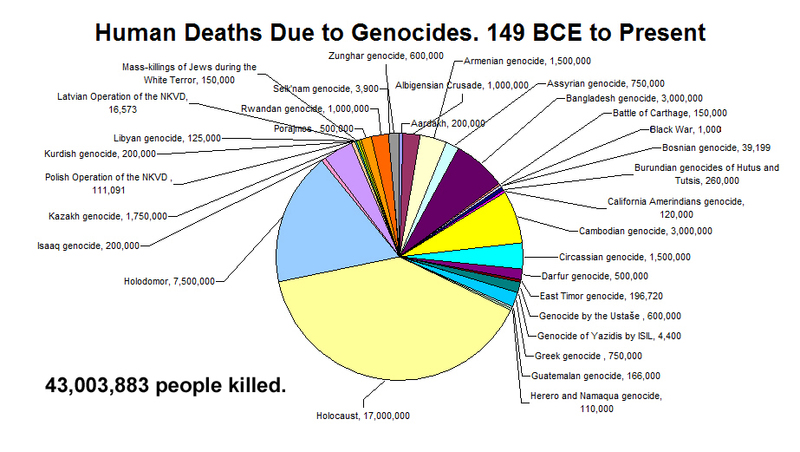 In this chart, genocide has been dwarfed to near nonexistence. 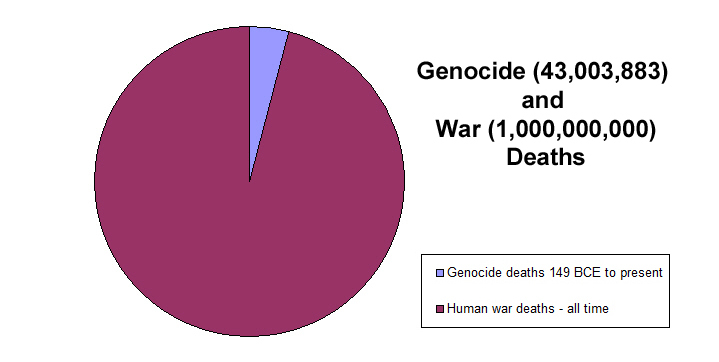 The entire history of war deaths is a small slice of the pie. 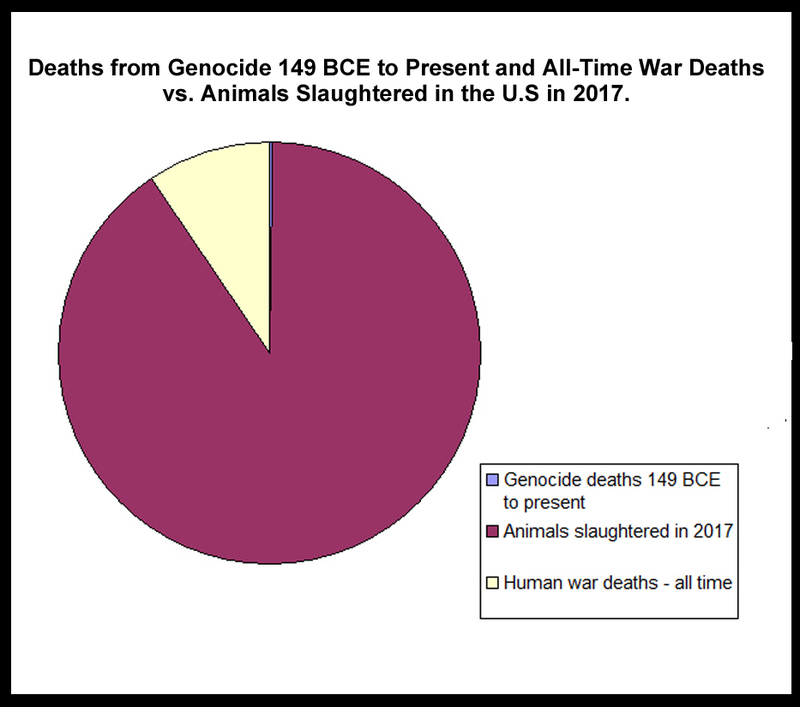 That's the number of animals killed in one year and the number of each other we have killed for as far back in history as we can look. I was surprised by this data. It's hard to grasp the numbers involved, the individual animals it represents. Moreover, this pie chart represents a single year. The chart from the previous year is essentially exactly the same. The purple section is repopulated every year. Every year. While the other sections, the white and sliver of blue, represent what happened in the past -- no new human victims are being represented in previous or succeeding charts. And for the most part, we say those deaths are proper and OK because they are legal or regulated or whatever. And if that is so, then we must have in our heads some calculus, some ethical ratio that says one human life is worth, a billion animals? This is why the planet is in such dire shape. We are consumed by our own image. We believe ourselves to be gods. We are writing in response to your June 28, 2005 letter. You expressed concerns regarding the explicit comparisons the National Primate Research Exhibition Hall is making between the Holocaust and harmful experiments using animals. The sentiments you express seem to be based on the simple implicit claim that whatever is done to an animal other than a human, cannot rise to the same level of moral concern as it would if it were being done to a human. Rhesus monkeys were trained to pull on one of two chains, depending on the color of a flashing light, in order to receive food. After training, another monkey, held in restraints, was displayed through a one-way mirror. Quite clearly, the monkeys in this study were following the Golden Rule. If we choose to live a moral and ethical life, it would seem profoundly wrong to intentionally hurt others who seem to understand this radical and history-changing idea. It seems monstrous that we would take such animals from their homes in the wild, destroy their social systems, breed them, experiment on their children, and on them, and justify the entire endeavor with the claim that it might be beneficial to us. This seems to be a profound case of hubris. We are offended that decades of documented cruelty are dismissed in such an offhand manner. There is nothing being "alleged". We state the facts. You claim that we have a fundamental misunderstanding of the Holocaust. My personal understanding of the Holocaust is based on years of reading and teaching. I brought the National Holocaust Museum’s traveling exhibition to my small community in 1995. That same year I had a survivor come to my classroom and speak with my students. I have read most of the works written for adolescents many times over the years with my students. I have read many scholarly works devoted to various aspects of Germany’s policies and practices during the Nazi era. When learning about the Holocaust, slavery, racial strife, the Killing Fields, and other examples of our inhumanity to each other, my students invariably asked why people allowed such things to happen; why didn’t they do some thing to stop them. Although I had no concise answer for them, we always agreed that the people who spoke out, who hid Jews, who helped blacks escape to freedom, who stood with the oppressed, were acting as we hope we would have acted if we had lived through those times. Once the implication of the discoveries regarding animal mind are understood, the realities of the current situation become impossible to describe in terms other than those used to talk about past atrocities. The Holocaust, I hope you agree, was not an experience unique to the Jews. The Final Solution was a unique aspect of the Holocaust. We do not claim that a parallel event is occurring today. There is no genocide occurring today in the primate labs. We do not claim there is. I finished reading Vivian Spitz’s Doctors From Hell (Sentient Publications, 2005) just recently. As you may know, she was a court reporter during the Medical Case (Case #1) of the Subsequent Proceedings of the Nuremburg War Crimes Trials. The convicted medical doctors and medical assistants were found guilty of Crimes Against Humanity. Their victims – their experimental subjects – were a very heterogeneous group comprised of common criminals, political prisoners, Russian prisoners of war, Gypsies, Poles, the infirm, Jews, and others. It is this aspect of the Holocaust and the fact that no one was speaking out in protest, that we draw attention to in our literature. Given that in both situations, medical doctors and scientists were and are being given authority to make society’s moral decisions; given that the justifications are the same: we will benefit from their suffering and death; given that science has demonstrated, and continues to demonstrate, that the brains of monkeys and humans are so similar that the species’ subjective experiences are necessarily similar; given that scientists claim that monkey psychological reactions are directly applicable to humans due to our close evolutionary relationship and the attendant physiological and emotional similarities; given the demonstrable horrors of laboratory life, we feel that the parallels we draw are appropriate. Further, given the lack of education regarding animal mind, the historic willingness to ignore that which government tells us to ignore, and the historical facts regarding the consequences of doing so, we feel obliged to call attention to the issue and to draw parallels with the Holocaust where parallels exist. We believe that, if you consider this issue with an open mind and compassionate heart, you are bound to understand the accuracy and importance of what we are doing. Given your commitment to keeping the memory of the Holocaust alive and trying to assure that it does not happen again, we sincerely hope that you will lend your voice to our growing list of supporters. I hope you can see why I believe you are wrong. The message we seek to convey is that the suffering today is indistinguishable from past suffering. The silence today is indistinguishable from the past silence. Thank you for taking the time to write to us. I have enclosed information about the Exhibition Hall. Please do not hesitate to contact us with further questions or concerns. The recent public relations scheme to make the labs more transparent in order to make the public believe that hurting and killing animals in labs isn't so bad is probably the result of vivisectors not being able to come up with a winning argument in answer to the truth behind the chant, "Nothing to hide? Let us inside!" In modern times, they have ginned up a handful of excuses for keeping the public in the dark about what is going on behind their locked doors. They say things like: "visitors will disturb the animals," "the animals' health would be put at risk," or, in the case of activists, "they might go berserk." Those claims are a harder sell when it comes to the vivisectors' reticence at providing copies of photographs or videos. Then the arguments become something like "people wouldn't understand what they are seeing," or, "the photos would divulge trade secrets." But really, the reasons are the same ones that drove vivisectors from more than a century ago to keep what they were doing a secret. When their neighbors found out, they picked up pitchforks and ran them out of town. It is the vivisectors' recognition of their neighbors' potential outrage and disgust that explains more accurately why the labs are so secretive. It isn't likely that the labs will become more transparent. They might develop little quasi-Potemkin villages to help with the big hood-wink, but the people involved are, it seems to me, constitutionally incapable of recognizing what it is that the public is slowly coming to understand, namely, that animals are people too, beings with interests, concerns, emotions, precisely the things that are said to endow us with inherent rights. This means that if they proceed with a transparency gambit, it will be short-lived because they are unable to see animals through the eyes of the growing number of people who recognize them for who they are. This mouse and her pups are being used here simply as props. Mice are adverse to open fields; they naturally hide and avoid being out in the open, particularly during the day. In this image, the mouse and her pups appear to have been placed on a white surface and brightly lit. It is very likely that the open field coupled with the exposure of her pups is causing the mouse significant anxiety. Science magazine is a long-time defender of vivisection. 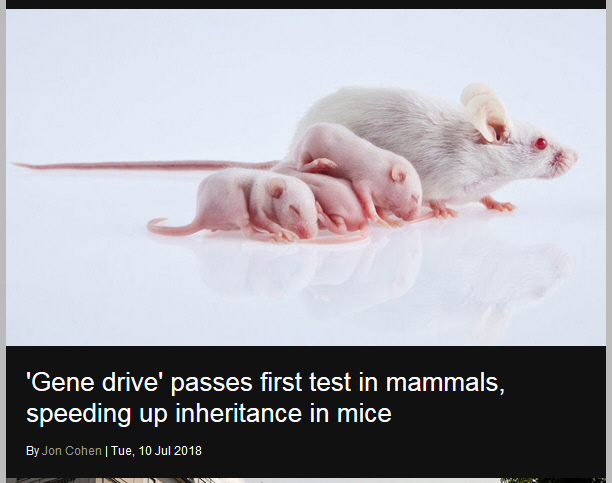 It is using it's wide circulation to help promote the idea that vivisectors are pushing for openness and transparency; but the editors were blind to the plight and likely distress of this mouse. This ethical blindness is at the root of every failed attempt to promote and defend the the use of animals in harmful experiments by engaging with knowledgeable critics. Vivisectors can't really prepare for such encounters anymore than a deaf person can prepare to discuss the tonal qualities of musical instruments. But it is apparently impossible to know what you are incapable of knowing, and so, every so often a vivisector can be convinced participate in a public debate or speak frankly about what is happening in a lab, but these events are very rare because even a blind person gets burned when they touch a flame.